While Matt Lauer spent the last 24 hours getting raked over the coals, his colleague Lester Holt was focused on preparing for his own role as moderator of the first presidential debate. But even as Holt was researching the candidates' records and gathering the facts that will inform his questions, the NBC Nightly News host was aware of the criticism surrounding Lauer, sources at the network told CNNMoney. 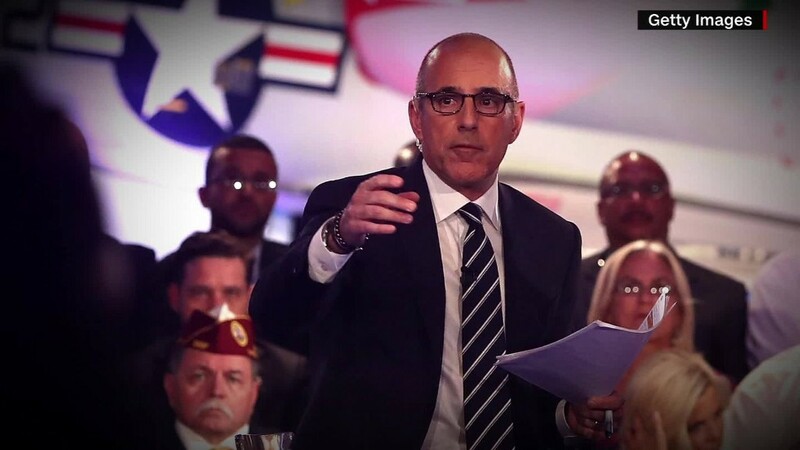 Lauer's handling of Wednesday night's "Commander-in-Chief Forum" -- described by one NBC executive as a "disaster" -- has drastically upped the ante for this cycle's presidential debate moderators. The public scrutiny facing them already promised to be intense given the unprecedented interest in this year's debates. Anything less than the impossible -- a flawless, balanced, and wholly rigorous performance -- promises to leave moderators exposed to a firing squad by spectators, pundits and political operatives said. "No question that this puts more pressure on NBC's Lester Holt," said Alex Conant, the Republican strategist and former communications director for Senator Marco Rubio. "Debate moderators are like baseball umpires. If they do their job well, nobody talks about them the next day. But in the current environment, that's probably an impossible goal." Meanwhile, many believe the Lauer criticism is a net win for Hillary Clinton, because of the perception that the "Today" show host was much harder on her than he was on Donald Trump. While Lauer dedicated one-third of his time with Clinton to her email controversy, he failed to fact-check Trump on his false claim that he had opposed the Iraq war. "Matt was constrained by time and was overwhelmed by Trump," said David Axelrod, Barack Obama's former chief strategist. "Lester, I'm sure, saw that, and the critiques that followed, and will be more likely to insist that Trump justify some of his more outrageous comments and claims." 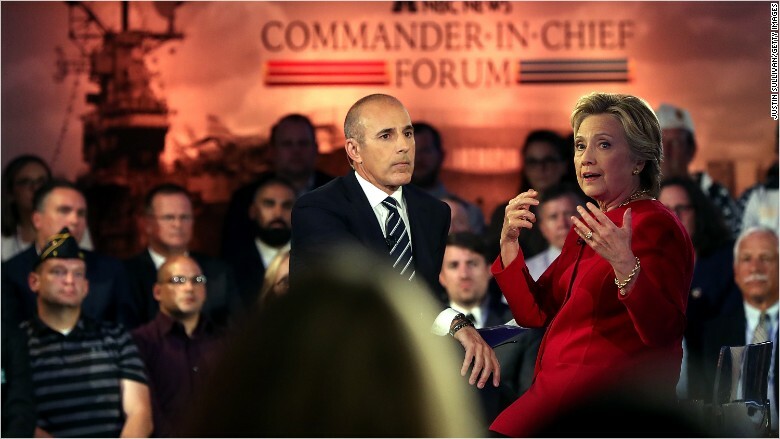 Related: Behind the scenes, NBC execs concede Matt Lauer forum performance was "disaster"
Some even interpreted the onslaught against Lauer as an attempt by Clinton supporters to influence the moderators ahead of the debates. "The criticism of Lauer is a transparent effort to work the refs prior to the debates," said Rich Lowry, the editor of the conservative National Review. "But it is the job of the opposing candidate to rebut Trump, not the moderators." Holt will moderate the first debate at Hofstra University in Hempstead, New York, on September 26. CNN's Anderson Cooper and ABC's Martha Raddatz will co-moderate the second debate, which will be a town-hall style event at Washington University in St. Louis, Missouri, on October 9. Fox News Sunday host Chris Wallace will moderate the final presidential debate at University of Nevada in Las Vegas on October 19. Debates are a different dynamic than forums and town halls, where the moderator is one-on-one with the candidate. Over the years, many presidential debate moderators have chosen to simply ask questions and let the candidates fact-check one another, believing it is the responsibility of the politicians to challenge their competitors. Wallace has already said that he won't fact-check candidates because "it's not my job to be a truth squad." Others have taken a different tack: In 2012, former CNN anchor Candy Crowley memorably and somewhat controversially fact-checked one of Mitt Romney's assertions about President Obama, a moment that played to Obama's favor. "In a debate, there is a candidate who should correct the record and challenge the other candidate. It's not the moderator's role to step in for the candidate," said Stuart Stevens, a top strategist on Romney's 2012 campaign. "Only one of the two people on stage will be president. The moderator should play a very transparent, unobtrusive role. Let the candidates slug it out." "I don't believe the moderators should fact check in real time," said Glenn Kessler, the author of The Washington Post's Fact Checker. "I would prefer if the candidates fact check each other, since the audience is there to see the candidate interact. But the moderators can use previous fact checks to frame the questions and highlight inconsistencies." Others hope Lauer's performance will at least encourage moderators to pose more pointed and specific inquiries, rather than vague, open-ended questions that allow the candidates to say whatever they want. Chait, the New York Magazine columnist, told CNNMoney there was "a decent chance: Lauer's performance will affect the moderators, and said, "It probably should." "These general questions stink," he said, before offering his interpretation of Lauer's questions. At the very least, the Lauer episode has almost certainly pushed the moderators to take the research process even more seriously than they already were. "This will only reinforce the importance of preparation for the debate moderators," Kevin Madden, another top strategist on Romney's 2012 campaign, said. "The most effective moderators know exactly how to guide the tempo of the debate, but they have also immersed themselves in the issues and the process of formulating the questions and the follow-ups to the point that they have a 360 degree view of the candidates, the issues and the political landscape. Anyone who has worked with some of these moderators knows that they take the preparation process very, very seriously."